There's more good news for chocolate lovers. Scientists have found that eating dark chocolate appears to improve the function of important cells lining the wall of blood vessels for at least three hours. The study, involving 17 healthy young volunteers who agreed to eat a bar of dark chocolate and then get an ultrasound, found that eating chocolate seemed to make the blood vessels more flexible, which helps prevent the hardening of the arteries that leads to heart attacks. But experts cautioned that the weight gain from eating a lot of chocolate probably would cancel out the apparent benefit. Dark chocolate is rich in flavonoids, which act as natural antioxidants — chemicals that combat the damage oxygen does to the body. However, that doesn't mean that chocolate binges will ward off a heart attack, experts warn. Cacao, the plant that chocolate comes from, has for centuries been viewed as magical and mystical, being used for everything from medicine to currency. Although enjoyed worldwide, until recently it was considered a treat that provided fat, calories but no substantial nutritional value. Studies have recently indicated it releases the happy chemical seratonin in the brain. 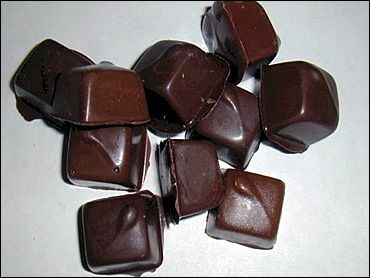 However, over the last few years, studies have suggested — much to the delight of chocoholics — that it is rich in flavonoids. The latest study, conducted by cardiologists at Athens Medical School in Greece, set out to test whether chocolate affected the functioning of the so-called endothelial cells in the walls of the blood vessels, which are thought to be affected by oxygen damage and are considered a mirror of the overall health of the cardiovascular system. The scientists, who presented their work Sunday at Europe's most important cardiology conference, gave 3.5 ounces of either dark, bittersweet, chocolate or fake chocolate to 17 healthy volunteers. On another day, the volunteers were swapped over, so that the ones that got the fake candy got the real stuff and vice versa. They had no chocolate outside of the study, and investigators did not know what each volunteer had eaten at any stage of the study. An ultrasound was taken of each volunteer's upper arm to see the functioning of the endothelial cells in the main artery. The cells accomplish their goal of controlling the stiffness of the blood vessel by secreting several active substances that regulate the flexibility of the vessel and influence clot formation. "During the chocolate session, endothelial function was improved, whereas during the placebo day there were no such changes," the study concluded. "The favorable effects of dark chocolate lasted for three hours at least." By improving the blood vessel flexibility in apparently healthy people, dark chocolate emerges as perhaps a power food, the scientists said. "At this time, we do not know whether regular intake of dark chocolate or other cocoa beverages could result in a reduction of total cardiovascular" problems or death, the study said. Experts warned against gorging on chocolate as a way to ward off heart trouble, reminding that excess calories lead to weight gain, which is a powerful trigger of heart problems. Any benefit to blood vessel flexibility would probably be wiped out by the danger of the weight gain, they advised. Also, while antioxidants in theory help keep the heart healthy and looked promising in early research, recent rigorous studies investigating whether antioxidant pills such as vitamins A, C and E ward off heart attacks have shown them to be useless. Dr. Michael Gibson, associate chief of cardiology at Harvard University-linked Beth Israel Hospital in Boston, said the chocolate study was "interesting." "There are a few basic science reasons why this might be good, but keep in mind that antioxidants also improved forearm blood flow but that didn't necessarily pan out as an effective treatment," said Gibson, who was not associated with the study.